Learning about how meditation and other relaxation techniques can assist in recovery. Information about building a daily practice. Building a firm meditation practice can really transform your unhelpful habits, behavioural patterns and relationships. It can literally make your body, mind and life, in general, a much better place to exsist. The type of meditation that can really help to transform your life is one where you spend time aside from your mind. It’s a reflective exercise where attention is payed to the breath so that you observe your mental patterns, rather than simply being them. This practise is often called mindfulness meditation. It’s different to other relaxation methods, such as guided creative visualisation or hypnosis, where there is an aim or an experience of intending to lift up and out of yourself. This is incredibly useful for the purpose of relaxing, or in the case of hypnosis, for working on changing, an already identified negative habit. However, these techniques may not offer, true transformational change within us, without the addition of a meditation practice. This is often because it can lead to escapist tendencies or avoidance of truly being with, and seeing the mental constructs which are keeping us stuck in the same cycles of behaviour. Of course, becoming more present and awake to the moment doesn’t have to arrive solely out of meditation. Many people can come to this in other ways, through shock, life trauma or just an evolving entry into an alert being state. However meditation for many, remains a useful tool to become steadily more free from the mental suffering. 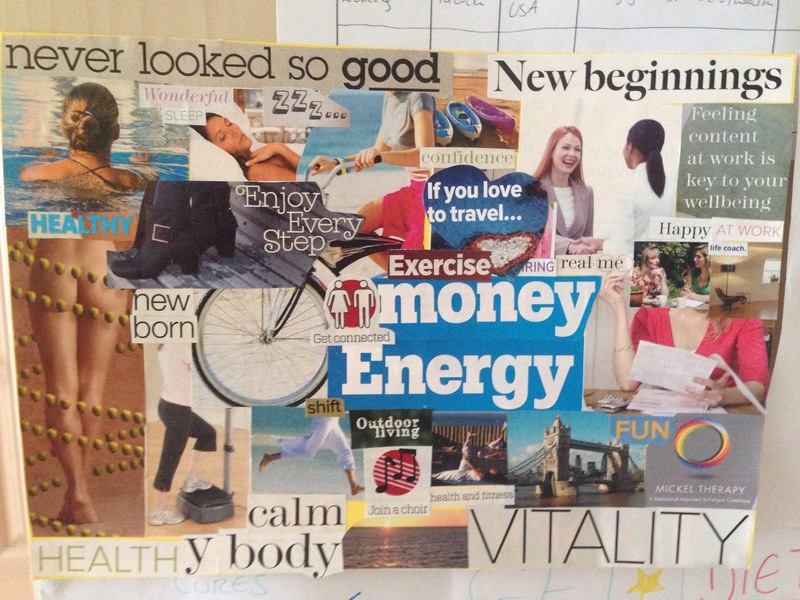 Last year I created this vision board, when I was really struggling on my recovery. I remember finishing it off in December on a day where it hurt just to hold the scissors and turn the pages of the magazine. Now, eight months on, I’ve achieved the majority of goals within this vision. My bum still isn’t quite like the beautiful peach depicted on the board but I continue to work on it. However, I did have some more pressing things to focus on over the year. Not just about ME/CFS, Fibromyalgia, Pots and Hypermobility recovery, this blog is useful for anyone who is experiencing a health problem, life crisis or is just in need of some inspiration! It offers insight into a truth which effects us all. This is the universal theme of change. At some stage we all experience ups and downs because we are all connected to the same invisible thread. So whether you are seeking encouragement whilst dealing with a chronic illness, or simply in need of some holistic, wisdom, love and support, these musings should get you started. Transforming the self to transcend ME/CFS and Fibromyalgia. A true healing journey from the inside out. Weight and Body Transformations and Even Macdonalds!